If you need a room in less than 7 days from today, please call the location directly. Room reservations for the following year cannot be made until November 1. For reservations outside normal library hours, a security fee may apply. Please contact specific location. Make Your Reservation here (pending approval). If you have questions or trouble reserving the rooms, please call (719) 562-5600. •Room reservations for the following year cannot be made until November 1. •Room furniture may be adjusted but cannot be removed from the room or moved between rooms. •Most reservations are free of charge. However, private events in the Ryals room or InfoZone Theater at Rawlings cost $300 and $200 respectively. •For reservations outside normal library hours, a security fee may apply. Please contact specific location. General security fee is $20/hr for 3 hours minimum. Rawlings library reservations often require two guards. • Candles not permitted due to open flame. • Ryals room balconies are only occasionally opened to library programs. Non-library reservations cannot access the balconies due to insurance. • Room fees due in full before reservation can be finalized. 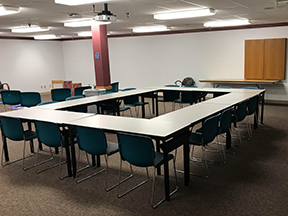 • When reserving the first floor meeting rooms at the Rawlings library, the room furniture should be returned to its original configuration (shown in a photo located above the light switch in the room). •Customers will not be permitted inside meeting rooms except during their reservation times. For your own convenience include any setup time you need in your initial reservation. • Early arrivals starting at 8AM are permitted with one week’s advance notice to the Meeting Rooms Coordinator. The security guard on duty will be responsible for letting early arrivals into the building. 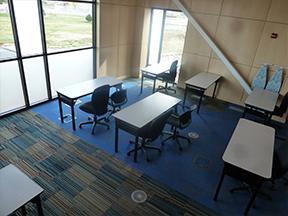 • When reserving the Ryals room or InfoZone Theater at the Rawlings library, please include any setup preferences. Typical setup styles are banquet and theater. If setup preferences are not communicated to the Meeting Rooms Coordinator by one week before the reservation, a setup based on the given information will be assigned or if time permits the listed contact person may be contacted by the Meeting Rooms Coordinator. For more assistance please contact the location directly. For help with Rawlings Library reservations please contact the Meeting Rooms Coordinator at 719-562-5638 or sarah.meador@pueblolibrary.org. Feel free to leave a voicemail and the Meeting Rooms Coordinator will get back to you within one week. For reservations within the next week or other time-sensitive reservations or requests, email is the fastest contact method. 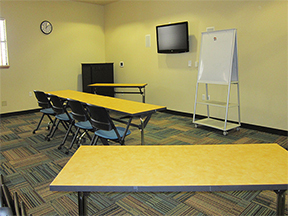 PCCLD provides wide access to its meeting rooms on a first-come, first served basis to as many citizens as possible. 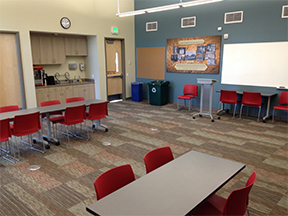 PCCLD welcomes the use of specific rooms for meetings and other gatherings. Fees may be charged. 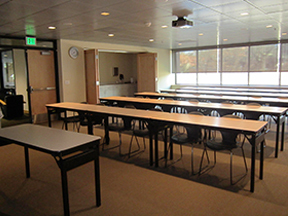 The provision of public meeting rooms is one of many methods used to provide access to ideas representing all points of view on all subjects. 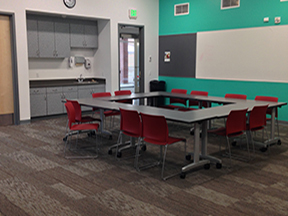 PCCLD allows organizations and groups to use library meeting rooms when those facilities are not needed for PCCLD administrative use, activities sponsored by the Library in whole or in part, and when such use does not disrupt PCCLD programs and activities. Such permission is revocable and does not constitute a lease. PCCLD reserves the right to deny applications for use based on the availability of space or staff, frequency of use, or as deemed necessary by PCCLD’s Executive Director. 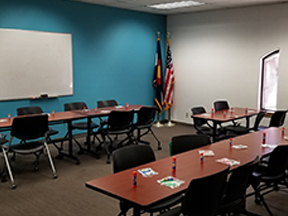 Permission to use a meeting room does not imply an endorsement of the aims, policies, or activities of any group or organization by PCCLD. No advertisements or announcements implying such an endorsement are permitted. However, PCCLD may elect to provide notification to the general public about a group’s meeting or activity. All activities and programs conducted in PCCLD’s libraries must comply with all federal, state and local laws and are subject to the rules and regulations of PCCLD. PCCLD reserves the right to have representatives attend any meeting held in its facilities to ensure no unlawful activities are occurring on library premises. 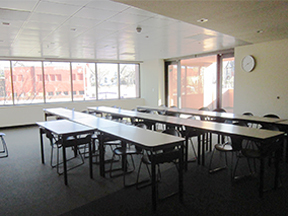 Groups or organizations failing to comply with any part of this policy or for any of its established meeting room guidelines may be denied further use of PCCLD meeting rooms. The use of a library meeting room signifies acceptance of the terms of this policy. 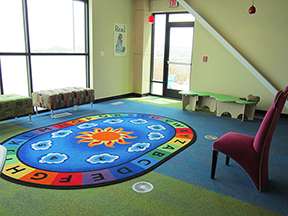 PCCLD reserves the right to cancel reservations or refuse use of a meeting room at any time. PCCLD’s Executive Director or his/her designee is authorized to establish administrative procedures, rules and guidelines for this policy on a district-wide basis. 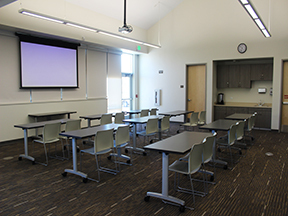 Meeting rooms are provided free and open to the community at all PCCLD facilities both during and outside regular business hours. 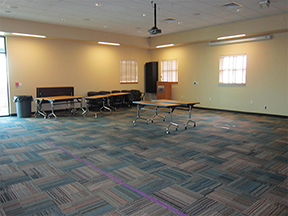 Each facility has furniture and equipment available for use within these meeting rooms. 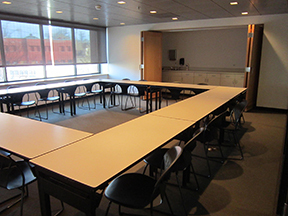 Meeting rooms should be returned to the same set-up and level of cleanliness as provided. Time limits must be adhered to. Meeting preparations and take down must be made within the reservation timeframes. Selected rooms in each facility may be reserved for use in advance. Beginning November 1 of each year, reservations are taken for the following year. Most meeting rooms are free of charge. 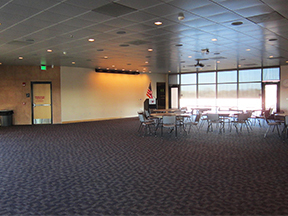 Use of the Ryals Special Events Room and InfoZone Theater requires a fee when used for private gatherings, such as wedding receptions and parties not open to the general public, or after-hours use. The charge is $300 for the Ryals Special Events Room and $200 for the InfoZone Theater. If security staff is required, a fee will be charged. See Security for more information. Payments can be made by cash, check, or card. An invoice can also be provided for electronic payment and will be required for credit card payments. Cash payments must be made through a library account using the self-check machines located at any library location. Food may be served in all meeting rooms. 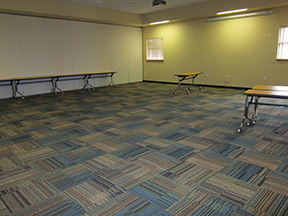 See room details for more information regarding equipment available for food preparation. PCCLD must be notified in advance if alcohol will be present. Alcohol cannot be sold in the library or served during library service hours. Alcohol must be served at a tended bar. The Library reserves the right to not allow alcohol to be served at an event if one or more of the principal hosts are under the age of 21 years. The responsibility of compliance with alcohol laws and regulations rests solely with the host to assure that minors do not consume or “help themselves” to alcohol either at self-service tables or left unattended at guest tables. Library-contracted security staff are required when alcohol is present and during events occurring outside regular business hours except at these specific locations: Giodone, Greenhorn Valley, Lucero, and Pueblo West Libraries. There is a fee for security staffing. The fee is hourly with a 3-hour minimum at $20 per hour. For events occurring after-hours at Rawlings, two guards are required. Early arrivals starting at 8:00 a.m. are permitted free of charge with one week’s advance notice to the Meeting Room Coordinator. The security guard on duty will be responsible for letting early arrivals into the building. The applicant is responsible for any damage to the facility and equipment that occurs while in their use. The applicant will be charged the cost of needed cleaning/repairs when necessary. If unpaid, this balance will be submitted to a collection agency. The applicant is responsible for properly operating any library equipment provided. or Maria Tucker to reserve. Other: No log in required for computers. Smart board has whiteboard functionality. computer lab is specifically required. 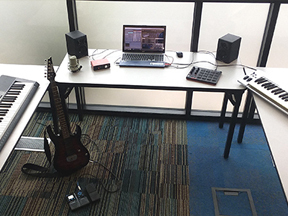 Music Box Prior to booking a recording time, please contact Cory (562-5600) to set up an orientation to learn the equipment. See equipment here.